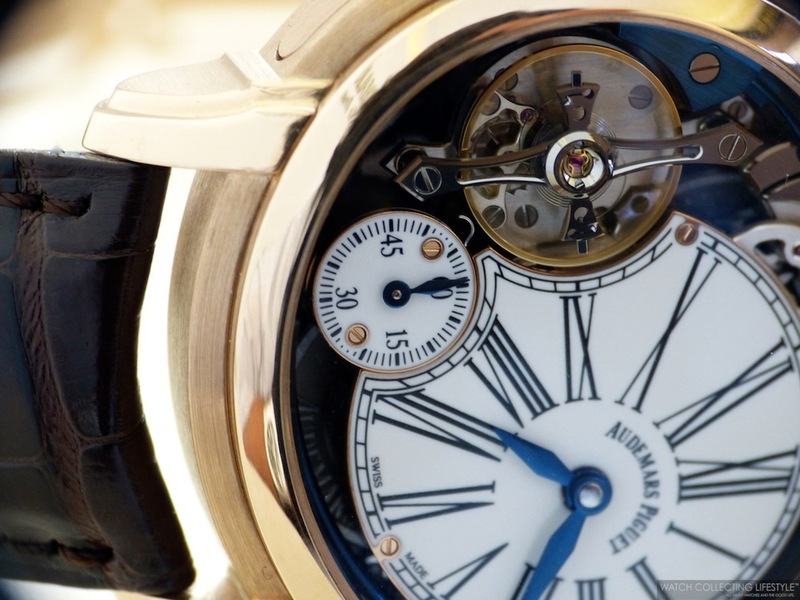 The Audemars Piguet Millenary Minute Repeater ref. 26371OR.OO.D803CR.01 in pink gold —presented at the Watches and Wonders Salon in Hong Kong laste year— is fitted with an 18K pink gold oval shaped case —measuring 47mm in diameter and 15.79mm in thickness— with enamel off-centered hour/minute dial at 3, an off-centered seconds sub-dial at 7 and minute repeater lever at 9 o'clock. This Millenary Minute Repeater features the Audemars Piguet Direct-Impulse Escapement and a flat double balance-spring. The beautiful white enamel dial features Roman numerals with blued hands and the finely tuned blued steel gong is fully visible around the circumference of the face of the watch. A perfectly balanced dial with very intricate and nicely finished touches. This fascinating complication and elegant watch is powered by the entirely conceived, developed and produced Audemars Piguet hand-wound calibre 2928 composed of 443 parts, 40 jewels, flat double balance-spring and that provides a power reserve of almost seven days —165 hours— when fully wound. The beautiful calibre with its horizontal 'Côtes de Genève' decoration can be fully appreciated via the display case back. The case on this watch is a work of art with alternating brushed and polished surfaces. The three-position winding crown is very easy to use and nicely decorated with fluting and the AP logo. The sliding lever to activate the minute repeater is located on the left side of the case at 9 o'clock and is very easy to use. Once activated, you will listen to one of the most beautiful repeaters in the market. Something we have noticed about the Audemars Piguet minute repeaters is that they are finely tuned in a way where the sound coming from them is not only extremely clear but also very glassy. Almost as if you were listening to the finest baccarat wine glasses clinking. To round out this elegant timepiece, the watch is fitted with a gorgeous hand-sewn brown crocodile leather strap with large square scales that is secured by an AP folding clasp in 18K pink gold. The strap wears very comfortably and the clasp is very easy to operate. The Audemars Piguet Millenary Minute Repeater in pink gold provides unparalleled wrist presence that is heavily accentuated by its oval shaped case and its off-centered hour/minute dial. In person, the blued steel gong and blued hands look more midnight blue opposed to the traditional blued steel color you typically see in most watches. The watch wears very comfortably and true to its size on a 7-7.25" wrist. This timepiece is also available in titanium with anthracite dial in a limited number of 8 pieces. Sticker Price $496,800 USD. For more info on Audemars Piguet click here. Posted on December 3, 2014 by Editor & Publisher and filed under Audemars Piguet and tagged Audemars Piguet Millenary Minute Repeater ref. 26371OR.OO.D803CR.01 Watches and Wonders Salon Hong Kong Audemars Piguet Millenary Minute Repeater in Pink Gold Audemars Piguet Calibre 2928 Posts 2013.